Like so many others, I watched the opening ceremony of the Olympics on Friday night. While it wasn’t as epic or memorable as it was 4 years ago, nothing will ever top the opening of the London Olympics, it was still entertaining. My favorite part is the Parade of Nations, when all of the athletes parade into the stadium. It was interesting that in this year’s parade, Tanzania was followed by the Czech Republic. Bob Costas had explained that since these games are in Rio, they were using the Portuguese alphabet (which is the language of Brazil) to determine the order that the different countries entered the stadium. I have never studied Portuguese, so I can only assume that in Portuguese somehow the letter T comes before C. As such, the athletes from Tanzania arrived right before those from the Czech Republic. As a Moravian, I was interested to see that Tanzania, the country that is home to more Moravians than anywhere else in the world, preceded the Czech Republic, the country where the Moravian church was born. It was a very visual reminder of the great faith that the Moravians have shown over the last 559 years, ever since the followers of Jan Hus formed the Unity of the Brethren. Those first Moravians had great faith in the things that they hoped for; they showed great conviction in things that they couldn’t see. It was a faith that led them out of their homeland, to places that they had never seen, to share the gospel of Jesus Christ. By faith Jan Hus preached against the excesses and abuses of the church of his day. By faith the followers of Hus formed a new kind of church; a unity of the brethren who held faith, love and hope as their essentials. By faith Jan Amos Comenius prayed that a “hidden seed” of the unity’s faith would survive, despite the persistent persecution and almost complete extinction of the Moravians. By faith that hidden seed found refuge on the estate of Count Zinzendorf, along with religious refugees from all over Europe. By faith the remnants of the Moravian church gathered on August 13, 1727 and allowed the Holy Spirit to renew them. By faith Leonard Dober and David Nitschmann left their home and set out as strangers to a strange land. By faith the Moravians shared the Gospel to the very ends of the earth. By faith the small group of followers of John Hus grew into a worldwide church, from the Czech Republic to Tanzania and hundreds of places in between. All of this happened by the assurance of things hoped for and the conviction of things not seen. All of this happened by faith, something that seems to be in short supply in these days. We seem to be lacking in faith, we seem to not be sure of what we hope for, we seem to not have conviction in things we can’t see. If someone were to write a letter, not to the Moravians of today, but about the Moravians of today, the faith of our ancestors could be replaced by our fear. Our fear of not getting what we hope for. Our fear of what we can’t see. Our fear of losing what we have. Our fear of losing who we are or who we have been. By fear the Moravians held onto the past. By fear the Moravians failed to take risks. By fear the Moravians stayed as they were; instead of becoming who God was calling them to be, instead of becoming who God needed them to be, instead of becoming who the world needed them to be. If the Moravians had always been ruled by fear and not by faith, we would not be here today. Rather than being renewed and reborn in August 1727, the Moravian Church would have died. They would not have shared the gospel to the ends of the earth. They would have stayed there in their little village, afraid of losing what they had. The Moravian Church in 2016 is in a similar place. Our future is far from certain. This week, Moravian leaders from around the world will gather for Unity Synod. There they will confront the things that threaten to divide us, that could potentially destroy us. Let us pray that they will act in faith and not out of fear. This week, Moravians around the world will remember August 13, 1727. As we celebrate that spiritual renewal of our church let us pray for a new spiritual renewal of our church. Let us pray that our faith will overcome our fears. Let us pray that our hope will outlast our doubts. Let us pray that our love will outlive our hate. Brothers and Sisters, we don’t know what the future will hold; for our congregation, for our province, for our denomination. We don’t know what the future will hold; for our lives, for our nation, for our world. We don’t know what will happen. But we do know who will make it happen. We do know who is in charge. We do know who is in control. Let us put our faith in God. Let us place our hope in God. Let us live in the love of God. 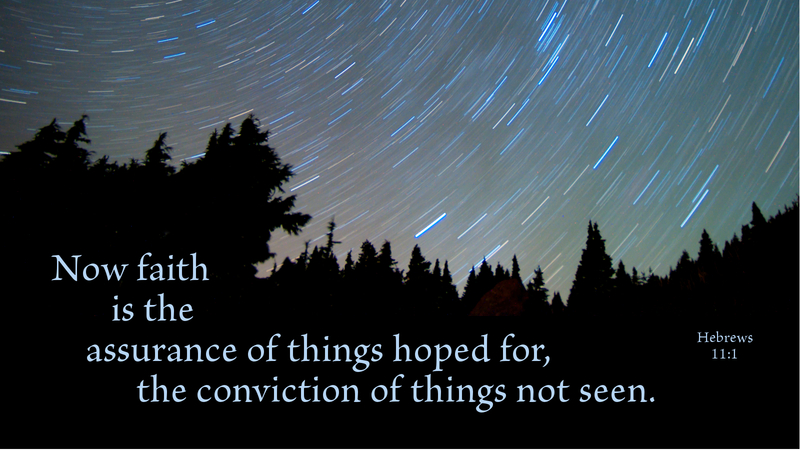 Let us live by faith, with the assurance of the things we hope for and the conviction of the things we can’t see. Let us live by faith and not by fear.